Are you one of those people who have always wanted a SIG 226 butÂ couldn’tÂ convince yourself to drop close to $850 for it? Yeah, I was too. Well it is time to rejoice because now you can get a SIG for less than half of a new 226. I have to admit that I was VERY skeptical when I first heard about the SIG SP2022, but it is one fine pistol. I donâ€™t know how it slipped past my radar for so long, but Iâ€™m glad I finally found it. Weight w/ mag 29 oz. The SP2022 is a polymer framed handgun with a Nitron coated rail. Although it may look a little chunky, it actually fits very well in the hand. I cannot say the same for the older 226’s though, so if you have slender woman hands like me, take a look at the SP2022 it might just fit. Overall I think this is one sharp looking handgun. The SP2022Â also comes with a picatinny rail so you can mount all the lights and lasers your heart desires. I do wish that the texturing on the front of the grip was a bit more aggressive though, it wonâ€™t slip out of your hands but I do not have maximum retention either. It also comes with a second back strap so you get to pick your size. The SP2022 is as easy as pie to operate. It has no safety but is equipped with a decocking lever. It is a DA/SA pistol with DA pulling 10 lbs and SA pulling 4.4 lbs. The double action pull on this gun is heavy but very smooth, although I have to say I do not know much about triggers so definitely try it out yourself before buying one. The trigger reset does seem somewhat longer but again try it for yourself, your opinion may differ. The gun weighs 29 oz. so it is not particularly lightweight, but it is definitely lighter than a all steel SIG. It comes in either 9mm or .40 S&W holding 15 rounds of 9mm and 12 rounds of .40 S&W. I cannot comment on the use of this gun as a concealed carry pistol because I donâ€™t have my license, so anything I say will be a guess and not helpful in the slightest. So you will have to judge that one on your own. One area this pistol would work well would be a home defense gun, because of the rail you can put a light on it and in my opinion the 9mm has plenty of stopping power with the right load. Another use for this gun is recreation, and this might actually be the most probable and best use of the pistol. If you buy the SP2022 you know you are working on a poor manâ€™s budget because if youÂ weren’tÂ you would just pony up the cash for a 226. Also since it is chambered for 9mm you are not going to go bankrupt shooting it. Recreational shooting is this pistolâ€™s territory and where it really shines. A few downsides to theÂ SP2022Â are the aftermarket accessories, because this gun is not widely known it has limited holster options. Also magazines are very hard to come by and generally cost around $40 a pop. I have about 600 rounds through the SIGÂ so far and have yet to see any malfunctions. I have used Federal 115 grain round nose which seem to work very well in the gun. I would not hesitate having this gun protect me and my family if the need arose. Now on to my favorite feature, the value. For how much gun you get for so little price is reason enough to go out and buy the SP2022. For around $400 you are getting awesome reliability, great ergonomics, and a gun that will last for a loooooong time. If you are new to handguns or are working with a very tight budget this is an option you should definitely consider. Awesome value, reliability, and accuracy but the lack of accessories hold it back. Also there are better guns for not too much more like Glocks, M&P, XD, but if you are set on a SIG and canâ€™t afford the 226 then get the SP2022, you wonâ€™t be disappointed. Join me in welcoming Nate, a new contributor here on Monderno. Nate is relatively new to the world of guns and gear but has a real passion to pursue it. He wants to learn as much as possible and help others get interested in the firearms community. Brandon great review! I did just recently purchase the SP2022 and really enjoyed it. I did have a slight issue with the slide not locking back after the final round…not a big issue for me and it was with cheap Aguila 124 grain 9mm FMJ during the 1st 100 rds. There actually are quite a bit of holster options that I have found (Maybe not as common as glocks, 1911s, and other sig models) but theyre out there. Also for an upgraded guide rod (Which are known to show wear on the SP2022) check out http://www.guiderod.com Again great review! Thanks Chuck, but the review was all Nate. The slide lockback issue is probably due to your thumb riding the decocking lever. Sorry make that Nate!!! Great review Nate!! I am not sure why people seem obsessed with Glock. The local range here had 2 different 9mm Glock models and a SiG P226 and I found that I shot a tighter grouping with the SiG than either of the Glocks. That is part of what encouraged me to purchase a P228 ($400 w/ 2 13rd and 1 10rd magazine). I just found that I had better luck with the SiGs myself. Good review on the SP2022, Nate. If I can find one to test out I will be looking for it. My first handgun was a SIG P228. I still love that gun. YES! Finally someone did a great review on the sig pro. Ive carried the 40 s&w version on a daily basis for the past year and have over a thousand rounds without a single hiccup. I own six pistols, glocks, xdm, Walther ppq, others as well which I’ve also carried, just not as long as this one. Every time someone asks me about my carry gun they have never heard of this particular model. Now I can direct them to this write up. It really is sits best kept secret. Been looking at this gun and I’m glad to see a gun review. Good review. 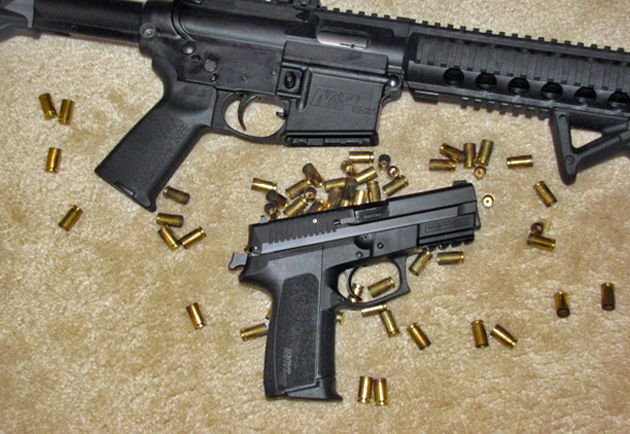 As any true Sig fanboy would be, I am still leery of the polymer cousins. Sure, I own a Mosquito, but that’s a tackle box gun. Let’s see, I have a couple 220’s, a 229, a 230, and I carry a 245 every day. I’ve never had a MALF with any one of them, although I did take a ration of %^& when I took the 229 to a Suarez event and tried to shoot the upside-down pinky drill. I have a nephew whom I begged not to buy a 250 just because it was inexpensive. He showed me … he’s never had a bit of trouble with it. I guess for me polymer still equals Glock and not the “me too” guns. That’s my fanboy opinion, just in case you wondered. The really interesting question is why “2022”? Half the people who see that think the thing is a .22LR and why wouldn’t you? Nice review Nate and welcome. I’ve recently gotten back into firearms after about a 15 year gap. Moving from IL to NC had a lot to do with it. I personally was attracted to the polymer guns and the 2022 was at the top of list. I however shot a buddy’s Glock and really like that and thus bought a couple of those to start with but couldn’t get the 2022 off my radar screen. About a month ago I finally picked one up and I’m really glad I did. For me, the 2022 was a very economical way to get into the Sig family and I thought the gun looked absolutely terrific. I have medium size hands at best and this pistol fit very well in my hand and I found both the DA/SA trigger pull to be very nice. I also experienced a few issues with the slide not locking back as one of your readers noted and a few FTF but the latter was completely my fault and down to a bad grip, which has been corrected and no problems since. I also found the stock sights to be very nice. I do carry it concealed from time to time in a ITW holster and its comfortable with minimal printing. I was not as lucky as one of your readers with finding holsters. I was looking for a good Kydex holster and several of the mfg. I traded email with stated that Sig had changed the rail on the 2022 in mid 2012 ( I believe it was ) and thus they hadn’t updated their molds. I went with a simple leather ITW style and that’s worked well. Overall, I think its a great pistol at a fantastic price ($450 to $490 where i live) given the Sig brand. Thanks again for the review, nice to see this pistol getting some attention. I have had my sig sp2022 for about 2 yrs and love it. Both sa and da trigger is amazing. After a few hundred rounds of 9mm, no jams. I agree holsters are a real issue. I got my 4 extra mags before the price increase. Nice review on a sleeper pistol. Kirkpatrick leather has a variety of holsters for the 2022. I’d like a nice single strap iWb kydex similar to the phl skeleton I got for my glocks. I have had a Sig 2022 in 9mm for a few years. I have about 3000 rds through mine and 4 pistol courses. Not one malfunction and it’s impressed ever person who’s shot it. I have had my sig sp2022 for about two years, it shoots straight and true and never had a jam. I got the night sights and they are fantastic. As far as holsters I got two from pro tech outdoors, one belt and a drop down leg style and for what I want of them they are great. Buy one, you will not regret it. Also see if it fits your hand and grip. Being a polymer frame it’s thinner and has multiple backstraps. Mine shoots like a dream and recoil is very managable. You are in Miami? I grew up in Pinecrest. Sorry folks My opinion is this Sig 2022 is the biggest piece of junk from a eye gouging company I have ever dealt with. Combat sighting is like throwing a baseball at a target in the dark and then charging the snot out of the person to correct the sight which they don’t even stock the original ones they put on from new. Beware this gun is HORRIBLE. Lack of accessories? 3 grip sizes (yes you do have to buy the others separately). Mec-Gar makes 17 rnd mags in 9mm for less $$. You can pop in a threaded barrel, steel guide rod. Plenty of holster options. Yeah, its not a Glock, but it has more options than FNH, and about the same as Springfield… plus, it’s a SIG! Mine came with tritium night sights, and I understand that they may not now – do the upgrade. Accuracy is fine and the action is smooth – this is not a target pistol. 2 years, several thousand rounds, and the only one FTF malfunction was due to limp-wrist. i’VE OWNED A P2022 FOR OVER AN YEAR NOW AND, LOVE IT DEARLY. ONLY ONE PROBLEM: I’VE HAD IT MOUNTED WITH A FRONT LASER SIGHT AND CANNOT FIND A HIGH QUALITY LEATHER HOLSTER FOR IT. IF ANYONE KNOWS OF A SOURCE FOR ONE, PLEASE , LET ME KNOW!